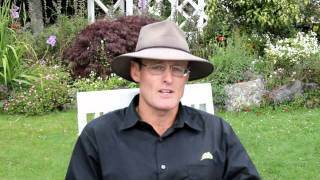 In this, the final part of our interviews with 4 Star Parelli Natural Horse Training Instructor Russell Higgins covers off how we should work with horses, and what courses he will be holding over the next few months, and in which countries. In this, our 4th Interview of the series with Russell Higgins, Russell talks about the most common problems that come up in natural horse training clinics, and what he finds is his biggest challenge. This is the third part of our River Valley Stables Interviews with Russell Higgins, a Parelli 4 Star Instructor. In this interview Russell talks about how horse and riders benefit from the Parelli Natural Horse Training System, and how this system differs from more traditional teaching systems. 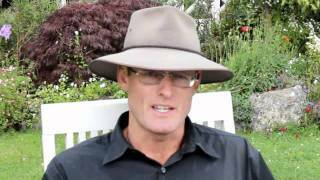 This is the second Interview with Russell Higgins, a 4 Star Parelli Natural Horse Training Instructor. In it Russell outlines what the benefits are to both Horse and Rider under the Parelli System. These interviews took place at River Valley Stables, Taihape, New Zealand, where Natural Horsemanship techniques are the basis of trekking horse training. Calibre, a 12 month old colt born at River Valley Stables in Taihape, New Zealand, is introduced to a rope, halters and leading for the first time. Didn't he do well? Calibre is part of the breeding program at River Valley Stables that concentrates on raising horses with good constitution, and suited for a horse trekking environment where he will have a variety of riders, with differing ability levels, riding him. 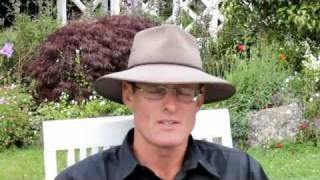 This is Part 1 of a series of short videos that chronicle the solo trip Brian Megaw took in April 2012 rowing a cataraft down the Rangitikei River in New Zealand, from River Valley Lodge to the Tasman Sea. 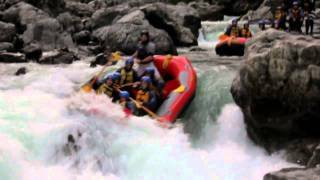 The reason for the trip was for time out, but also to get a feel for what the health of the river was really like. . All of this footage in this video covers scenery that can be experienced on one of River Valley's multi day rafting trips. The Rangitikei is New Zealand's fifth longest river. On it's 240 kilometer journey to the Tasman Sea it flows through a variety of geological strata, and riverside vegetation. It is a river in a hurry. Only when it gets near to the sea does it really slow down and braid out. 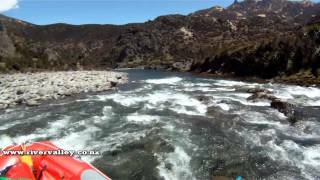 This video is a compilation made from head cam footage taken on a three day private trip in November 2011 on the Headwaters section of this river. Most of the rest of the crew were in catarafts, while I rowed a gear raft. No matter how many times I visit the Headwaters of the Rangitikei, I am still in awe at the beauty of the scenery, and how pristine the environment is. 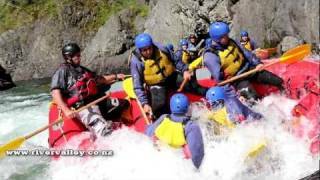 River Valley offer four day rafting trips on this beautiful section of the Rangitikei River. What do you get when you combine a Grade 5 Wet and Wild Rafting Trip with some of the highest, longest, fastest Bungy or Swing or Giant Flying Fox Rides? You Get the Rush! Small towns slide by as you drive State Highway 1, through the central North Island of New Zealand. There is little that really says to you - Get off the Main Road - Go Explore! The Rangitikei District, situated south of the mighty volcanoes of Ruapehu, Tongariro and Ngauruhoe, is one of those places where the Main Road is best left behind. An area that is easily driven through, but what surprises there are in store off that Main Highway. What Is The Rush to Find? For the adrenaline seeker, this area has Two of the Must Dos of New Zealand. Two Total Rushes! The Grade 5 section of the Rangitikei River, which runs the length of this district, is often regarded as one of the top half day, Grade 5 White Water Rafting trips in the world. Grade 5 is the most exciting white water commercially rafted. This same river canyon, downstream from the Grade 5 rafting section, is home to the highest bridge bungy jump in New Zealand. Added to the highest bridge bungy jump, is the Original, the longest, steepest, fastest Giant Flying Fox in the Southern Hemisphere, and the Giant Swing at 80m is often described as the scariest Giant Swing in New Zealand.. Do Both of These in One Day and What Do You Get? John McKee goes rafting in a different country every two years. In the last 25 years he has rafted 72 rivers. This year was New Zealand's turn, with John rafting most of the favorite rafting runs in this country. 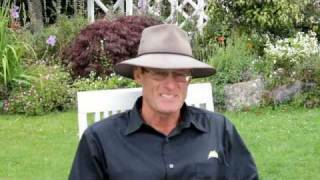 How does he rate the Grade 5 section of the Rangitikei River near Taihape on the North Island? Watch this video to find out. At periodic intervals, River Valley raft guides take to the river with no customers and go through a few essential rescue drills. These are often as much about making sure individual guides can meet the physical challenges of the job as anything else. 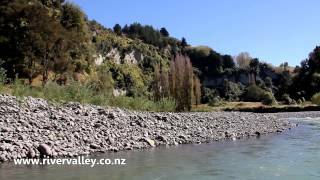 This footage was shot on the Rangitikei River, Taihape, New Zealand. The pictures in this video slideshow of rafting history at River Valley have been gleaned from boxes in the back of cupboards, off old CDs and other odd places. Many of the pictures were from old prints that have been scanned. 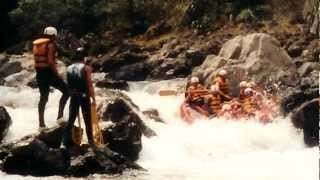 Rafting at River Valley officially started in 1982. A few of these pictures go right back to those years. As we unearth more pictures we will scan those and feature more of the guides who over the years have provided the unique River Valley experience.